Welcome to "Pathophysiology of Complex Patient Problems" PT 635 Pathophysiology of Complex Patient Problems. This is a wiki created by and for the students in the School of Physical Therapy at Bellarmine University in Louisville KY. Please do not edit unless you are involved in this project, but please come back in the near future to check out new information!! One in every two million people are diagnosed with Fibrodysplasia Ossificans Progressiva. The disease mostly begins in childhood, usually diagnosed before age ten. Nearly 90% of the time the disease is misdiagnosed and mismanaged by physicians or other health care providers. However, there have been 800 confirmed cases in the world and 285 in the United States. 67% undergo invasive procedures for diagnosis and treatment such as, an osteotomy, blood sample, or an MRI. 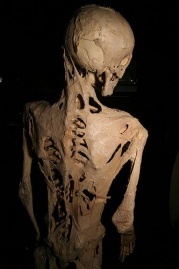 Fibrodysplasia Ossificans Progressiva has not been shown to be linked with any specific gender, ethnicity or race. Congenital hallux valgus with microdactyly and monophalangeal great toe are early signs that are often visible at birth. FOP primarily starts at the neck and shoulders then progressively moves to the trunk, back and extremities once the extra bone begins to form. Flare-ups are usually sporadic and unpredictable. It is impossible to predict duration and severity of the flare-ups even though there has been some characteritic patterns described in some research. It is also possible that flare-ups can occur from trauma. The average lifespan of these patients is approximately 40 years. Death is usually caused by respiratory infections or complications with thoracic insufficiency syndrome. Most individuals with FOP are confined to a wheelchair by the second decade of life and require lifelong assistance with performing activities of daily living and more than 50% of people diagnosed with Fibrodysplasia Ossificans Progressiva will experience lifelong disabilities. 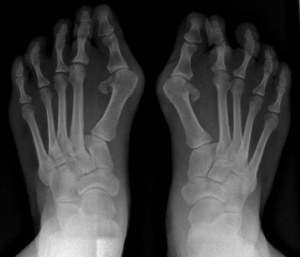 Fibrodysplasia Ossificans Progressiva can be misdiagnosed easily, but can be avoided by examining the individual's toes for the hallux valgus and the short great toe feature, along with a thorough clinical examination and a positive test for the ACVR1 gene. Genetic testing can now be done to confirm the diagnosis of FOP before the appearance of heterotropic ossification, which may avoid possible invasive treatments and diagnostic testing. Positive for heterozygous R206H mutation of the ACVR1 gene. Throacic Insufficieny Syndrome, a possible life-threating complication that can cause right sided heart failure and pneumonia. Maximizing pulmonary function and minimizing respiratory complications may be beneficial for these people. Hearing loss occurs in about half of the people diagnosed with FOP. Macrophages, lymphocytes, and mast cells will be present in early lesions of fibrodysplasia ossificans progressiva. History of UTI, low fiber diet, and decreased water intake may also increase the risk of developing kidney stones in people with FOP. These individuals are at risk for pressure sores due to the decrease in soft tissue and the increase in bone. Ultimately, there is not much that can be done to cure this disease. Surgical interventions are associated with numerous complications. Clementia Pharmaceuticals Inc. is currently working on a Phase II randomized, double-blind, placebo controlled study that looks at the effect of different doses of palovarotene on bone formation during a flare up and after a flare up. Palovarotene may prevent abnormal bone growth by disrupting the systems in the bone morphogenetic protein path, which allows for new bone formation. The trial uses three outcomes to obtain results from the effect of the drug on people with FOP: imaging for new bone formation, assessments of function, and patient-reported outcomes. Physical therapy has been shown in some cases to make the condition worse in individuals with FOP because it tends to cause flare-ups which eventually leads to further ossification of the ligaments, tendons and muscle. Aquatic therapy, however has been shown to be beneficial in maintaining ROM, pain relief, and aerobic endurance. Aquatic therapy provides low impact and resistance created by the water which ultimately, enhances the ease of activities of daily living, makes functional activities as easy as possible, and implements fall prevention precautions. Juvenile Fibromatosis connective tissues cells called fibroblasts that invade ligaments, tendons and muscles causing swelling. Soft tissue sarcomas/neoplasms there are many doctors that misdiagnose FOP for neoplasms due to the recurrence of soft tissue flare-ups. Henry Eastlack was a gentlemen who suffered and died from FOP. His skeleton is now on display at The Mutter Museum of The College of Physicians in Philadelphia. When individuals die their skeleton falls apart because the connective tissue, ligaments and tendons are no longer holding their skeleton together. When a skeleton is put on display at a museum it has to meticulously be rearticulated with wires and glue. Henry's skeleton never had to be rearticulated because of the extra bone created by FOP. His skeleton truly shows the harsh reality of FOP and the dysfunctions it can create. Quality of life of patients with fibrodysplasia ossificans progressiva. ↑ 1.00 1.01 1.02 1.03 1.04 1.05 1.06 1.07 1.08 1.09 1.10 1.11 1.12 1.13 1.14 1.15 1.16 1.17 1.18 1.19 1.20 Lakkireddy M, Chilakamarri V, Ranganath P, Arora A, Vanaja M. Clinical and Genetic Analysis of Fibrodysplasia Ossificans Progressiva: A Case Report and Literature Review. 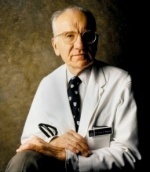 Journal Of Clinical & Diagnostic Research [serial online]. August 2015;9(8):1-3. Available from: Academic Search Complete, Ipswich, MA. Accessed March 19, 2016. ↑ 2.00 2.01 2.02 2.03 2.04 2.05 2.06 2.07 2.08 2.09 2.10 2.11 2.12 2.13 2.14 2.15 International Fibrodysplasia Ossificans Progressiva Association. 2009. Available at: http://www.ifopa.org/. Accessed March 22, 2016. ↑ 3.00 3.01 3.02 3.03 3.04 3.05 3.06 3.07 3.08 3.09 3.10 3.11 3.12 3.13 3.14 3.15 3.16 Pignolo RJ, Shore EM, Kaplan FS. Fibrodysplasia ossificans progressiva: diagnosis, management, and therapeutic horizons. Pediatr Endocrinol Rev. 2013;10 Suppl 2:437-48. ↑ 4.0 4.1 4.2 4.3 Abhishek K, Jain S, Khadgawat R. A case of fibrodysplasia ossificans progressiva: 20 years of follow-up. Neurology India [serial online]. March 2016;64(2):354-356. Available from: Academic Search Complete, Ipswich, MA. Accessed March 22, 2016. ↑ 5.0 5.1 5.2 5.3 5.4 5.5 5.6 5.7 Kaplan FS, Le merrer M, Glaser DL, et al. Fibrodysplasia ossificans progressiva. Best Pract Res Clin Rheumatol. 2008;22(1):191-205. 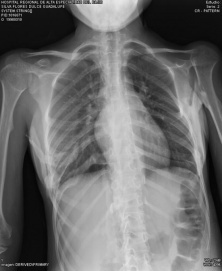 ↑ 6.0 6.1 Ulusoy H. Fibrodysplasia ossificans progressiva without characteristic skeletal anomalies. Rheumatol Int. 2012;32(5):1379-82.